When mentioning Richmond, British Columbia, people often think of the busy life style. Airport, Silvercity Cinema, Chinese malls and huge hotels. The list goes on, and good fishing spots are often excluded from this list. Ironically, with all this action going on around the city, there are some excellent fishing spots in Richmond. Garry Point Park is not only a productive fishing spot, but a family destination where other recreational activities can be enjoyed at the same time. Garry Point Park is located beside Steveston, a historic fishing village at the southwestern corner of Richmond. It is surrounded by wetlands, and often the scenic beauty of the Fraser River and gulf islands will make you forget that you are only 5 minutes away from the city. To get there, get onto No. 1 Road when arriving in Richmond, turn west at Chatham Street (approximately 500 meters south of Steveston Highway). Continue to the end of Chatham Street, you will arrive in the parking lot of the park. Like all estuary systems, the Fraser River mouth is fed by the sediments that the freshwater brings down the river, and pushed up by the saltwater during incoming tides. This process makes this area extremely productive, resulting in great number of fish. Don't be fooled by the silty, dark water, it is not fishless. In fact, there are many species of fish that you can target at Garry Point Park. Fish species that anglers might encounter include peamouth chub, northern pikeminnow, largescaled sucker, starry flounder, pacific tomcod, spiny dogfish, sculpin, dolly varden, bull trout, cutthroat trout and of course five species of pacific salmon! Between May and August, coarse fish such as peamouth chub and northern pikeminnow populate the area. You also have a chance to connect with a bull trout, but be sure to release these safely as the regulation requires you to do so. The salmon fishing is best in September and October. Pink salmon only returns during odd years. During the pink salmon season, which is September, thousands of fish can be seen making their way upstream in an strong incoming tide. 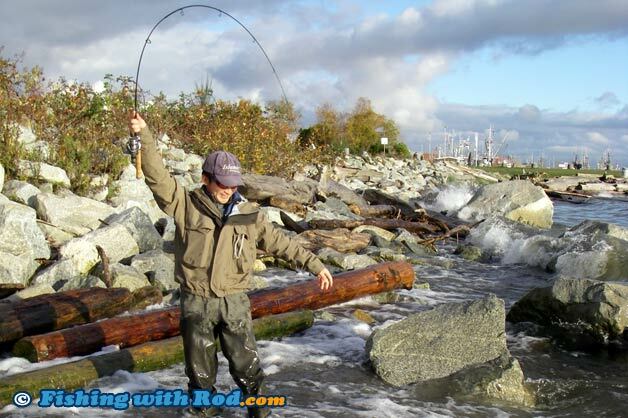 Coho and chum salmon fishing can be good at times in October and November. Inside Garry Point Park, you will find several bays with inshore beaches that are surrounded by rock piles. These shallow bays are usually productive because when the tidal current is strong, most residential fish hide in them. Next time when fishing at Garry Point Park, instead of chucking a large chunk of worms into the fast water, try fishing close to the rocks with a float. Peamouth chub and some incredibly large northern pikeminnow usually rest by the rocks waiting for you to feed them. You can also try spinning with a small lure to catch these northern pikeminnow. In early spring and late fall, you will also be able to hook the odd dolly varden and bull trout. Don't be fooled by the sandy beach, the bottom of the bay is rather snaggy, avoid using a bottom rig is the best solution. When salmon migrate up the Fraser River, they can be very visible from Garry Point Park. Take a walk down there during an incoming tide in August, you will often see thousands of sockeye salmon leaping to avoid being eaten by seals. Although sockeye salmon seem to be impossible to catch from shore in the Lower Fraser, you still have the opportunities to catch other salmon species from shore in this area. In odd years, thousands of pink salmon move inshore in late August. These aggressive salmon will take lures of any kinds without hesitation. Try using a 6 to 8 foot casting rod and cast a brightly coloured spoon out where boils can be seen. By late October, chum salmon can be seen passing by the park. These chum salmon can also be caught by spoons. The advantage of fishing at Garry Point Park is that you can reach all your favorite stores and restaurants within minutes. A few minutes walk to Steveston, you can find several tackle stores in case you run out of hooks and weights. There are many malls located within a few blocks from the park. If it rains during fishing, you can simply drive to them for a cup of coffee. It is also a fishing spot for the entire family. There are areas where you can play a few balls games, throw a frisbee and fly a kite. If you are fishing in the evening, have a BBQ by the beach and watch the sunset. Don't forget to take a walk along the trails and check out the wetlands, pay attention to the beautiful migrating birds. Please respect other users and keep the park clean.